We have studied many of the technical parts of a project that make it successful. Good leadership, organization, and communication skills are ideal qualities for a project manager. With the growing diversity in different countries and the coordination of projects with global members, it is important to keep in mind the cultural differences which are unique to each person. Having a good understanding of the people who make up the project can make the project run more smoothly. Tensions sometimes arise when people misinterpret body language or the way that people say things. Misinterpretation of ideas and opinions can lead to project delay and/or poor quality product delivery. According to the article, things like accent, silence, gestures, and eye contact can mean different things for people in different countries. For example, not giving eye contact can mean a sign of respect for people of certain countries whereas in others, it is disrespectful not to look at someone when they are talking. Not only are project managers dealing with people from different countries, they are also being thrown into a workforce where there are different age groups. There are currently 4 generations in the workforce today. These include veterans, baby-boomers, Gen. Xers, and Nexters. The last two generations are more diverse and flexible because they grew up in a more diverse society. Although it is important for project managers to have effective communication and be able to balance the differences in their groups, it is also very important for the people forming those groups to be open and flexible as well. They have to be conscious that the people in their group are different from them and that not everyone sees the world the way that they do. This is true even when people are from the same culture. A good PM will get to know every person individually in order to better understand how to effectively communicate with the entire group. Within the aerospace firm that I work, there are dozens of projects being completed on any given day and time. We have a matrix organization in which PM’s lead projects by utilizing members whom have their own functional manager and have multiple project responsibilities. Our company, which is small relative to other aerospace divisions whom manufacture similar systems, has made great strides in developing PM tools to be successful; our PM’s are now trained in and utilize MS Project and its toolset, they have developed WBS tools that are utilized across each project being utilized, and most importantly, all tools are standardized so that each PM and project team have a repeatable game plan and tool set for projects which change ALL the time. However, our company has continued to see wide variation in project success in terms of timeliness, cost and performance. Even with the added tools, we have only seen marginal improvement. What could possibly be missing? Enter the Project Communications Plan! A Project Communications Plan, as described in the text in Chapter 4, highlights the importance of internal planning for communications. Projects see all types of variance against original plans. This communication tool ensures a constant cadence in which all functional units of a matrix organization understand their responsibilities and accountabilities as the project progresses and changes. I felt that this piece of project management was the missing link for our company’s projects; project charters, WBS baselines, RACI charts (responsible, accountable, consult, inform), and weekly project meetings were simply not enough for our team to meet the mega trifecta of project success – on time, at cost and meeting performance requirements. After doing some searching, multiple sources identified that a formal PCP was the most vital form of team collaboration. An excellent explanation can be found on TechRepublic’s website: blog 1\Communication plans are key to project success – TechRepublic.html. The PMI Institute also further quantified the importance of communication via a white paper, and PMI identified that 80% of highly effective communicating project teams met original goals: blog 1\Communications_whitepaper_v2.ashx. The text highlights (5) important segments of a PCP that ensure a team that is aligned with its internal and external expectations; of which (2) I feel provide singular value above the Project Charter. I felt that the (1) Information Needs and (2) Sources of Information piece to the PCP offer an excellent way of ensuring team success. By identifying the “When/Who” a team member receives its information, positive project pressures are applied to each individual. I feel that positive project pressure is an excellent way to ensure team cohesion and “buy in”. I feel the best way to implement PCP is to have the team get together right after the WBS and milestones for the project have been defined. Then, each member can understand upfront, how they are impacting each phase of the project, at a task level, and more importantly, how each individual relies on the other to ensure tasks remains on schedule, on cost and meet performance. A PM can act as the guide for the PCP and also better understand the flow of information between functional departments (especially when the PM is not the resident expert for any of those functional departments) in order to make sure each task is implemented on time. Does the class feel that this is true of projects worked in past? Are other similar applications of a PCP utilized in PM efforts? In a June 12, 2013 article, I read from the Project Management Institute (PMI), it says that in a recent study the government risks $148 million for every $1 billion dollars spent. This is $13 million more than the private sector. Mark Langley, PMI President and CEO says there are findings where the government is doing very positive things, but he also goes on saying that just 46% of government organizations understand the value of program management. He also says that program success rates are declining with just under two-thirds of programs meeting their original goals or intent. He talks about how both the government and the private sector have work to do in effectively aligning program management with organizational strategy and mission. He says that more than half of the government respondents acknowledged that they frequently focus on specific departmental objects as opposed to the strategic goals of the organization. Only 11% of the government organizations have a senior-level program management related role, compared to 22% in the global average. Only 37% of respondents reported there is a formal process for developing program management competency and only 25% reported having a defined career path for those engaged in program management. This is 17% lower than the global average. These are staggering numbers when I read them. I decided to see what this meant to the taxpayer. I went to the Federal Reserve Bank of St. Louis to plot what the government has spent over the last few years. 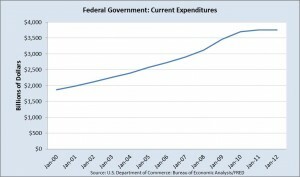 With the exception of the last 2 years, the government has averaged a 7% increase in spending year over year since 2000 and we spent $3.7 trillion in 2012. 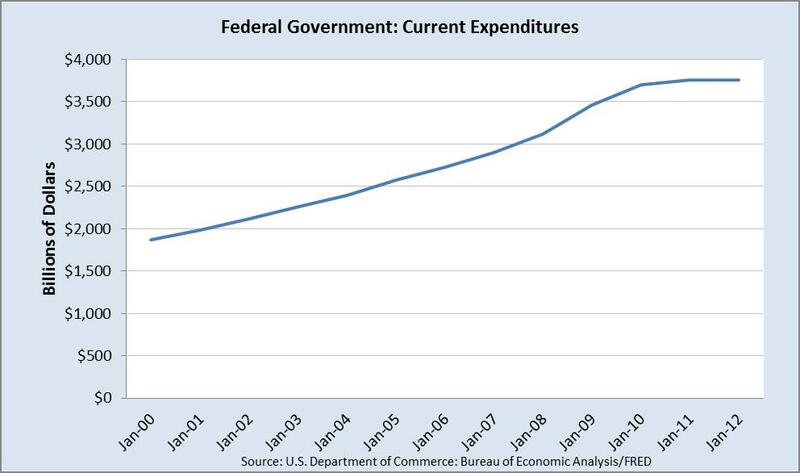 If we just looked at the $13 million more in risk that the government takes over the private sector it adds up to almost $50 billion per year as you can see on the chart below. With all the focus on project management and business efficiency, I’m frustrated that the US can’t move forward with this and pave the way for a better run Government. 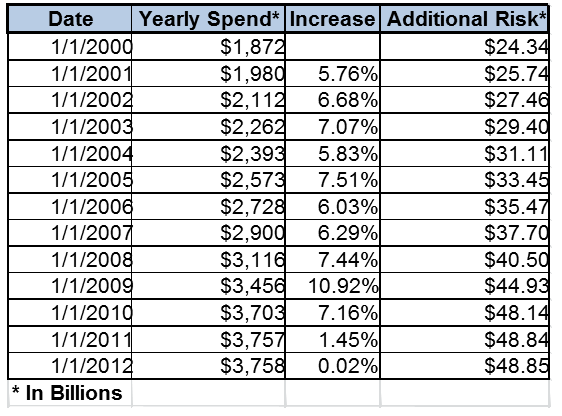 As the PMI published chart shows below, there are great rewards for a mature project management organization. Two things stood out to me in this article. First, I find it extremely disappointing that project / program management doesn’t align with the overall strategy and that departments are working in silos. I know this isn’t unique to Government. Unfortunately, I’ve also experienced this at a few different places and struggle with it today. Secondly, I don’t know how the government does their budget, but we consider risk when putting our budget together based upon probability and impact. This means there is less money to use for other projects and programs people want. I struggle with this topic because we want to ensure we capture all risks of a project, however, it ties up a lot of money from being put into other uses. How have you or your organization ensured that the projects/programs align with the corporation’s overall strategy? How have you been able to keep everyone working toward the common goal and not focus on his or her own segment? 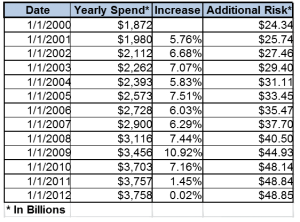 How do you plan your budget? Do you consider risk? How do you balance appropriate risk with risks that tie up your funds for other projects?